Guntur: The AP government has increased allocation of funds for construction of churches. 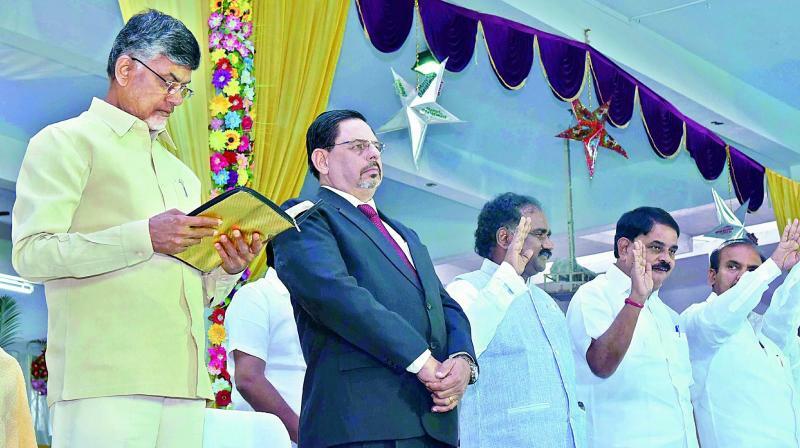 Chief Minister N. Chandrababu Naidu, who participated in the Christmas celebrations at Swasthisala at Kakani in Guntur district on Sunday, handed over the copy of a GO, which stated that the funds for construction of a church have been increased from Rs 1 lakh to Rs 3 lakh, to the Christian community elders. Mr Naidu recited holy verses from the Bible and explained about the motto of Christianity to the devotees on the occasion. Mr Naidu, quoting the words of Mother Theresa, “Not all of us can do great things but we can do small things with great love”, urged the people to collectively working for the development of the society which, in turn, would develop the state.He said that no other state in India was offering gifts to the poor on every festival, except AP. The TD government has offered Chandranna Christmas Kanuka to Christians with an expenditure of Rs 334 crore. He said the state government had spend Rs 57 crore for the welfare of Christians and increased aid for Jerusalem pilgrimage to Rs 40,000 from Rs 20,000. Responding to the request of the Swasthisala organisers about providing special train to Kakani on Monday and Saturday, Mr. Naidu said that public in large numbers visit the Swasthisala on both the days and so, the APSRTC will increase the number of bus services. He also promised about taking the issue of special train to the notice of the railway department. He assured the community of protecting the assets of churches.